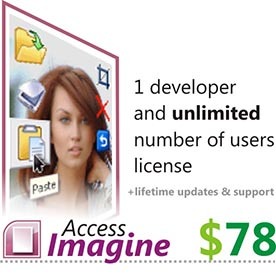 Once you have registered version of AccessImagine, all users that work with your databases will experience registered version too – without any advertizing and reminders. They will not see even the name of component actually. Please provide your real e-mail during payment process. You’ll receive your activation code on your e-mail shortly. Contact access@bukrek.net once you have any questions or problems with payment processing. 2CheckOut.com Inc. (Ohio, USA) is an authorized retailer for AccessImagine Control. My picture is mirrored the other way. How can i correct this. Pls ignore. My camera setting. StoragePath can be set with VBA, but you need to write it before AccessImagine starts to load image into control. I’m not sure if that is possible for regular form display scenario. Like others, I had troubles with the StoragePath via the Property Sheet. The only thing that worked was a hardcoded path for me. And, that wasn’t good enough. UNC did not work either. Got I/O error 53 and other error messages. Here is what worked for me in VBA. Plus, when I work on the desktop or the laptop or from a USB drive, they all find the images. The “form” below is the one with the AccessImage control on it. Can this be used with connecting to Bluetooth camera or iPhone? I don’t think its possible – until you are not able to use that camera with Skype. We are running MS Acess 2007 on Windows 7 and Windows 10 systems. 1. How to see the path where AccessImagine stores the webcam images? 2. How to copy the stored AccessImages images to another folder? In your Getting Stated (video) in form design you inserted an ActiveX control. However in our MS Access 2007 we cannot see “ActiveX control” in form design. can we show the camera picture inside the access form before taking the picture? No. Camera picture is displayed in separate popup window. I am about to purchase the code. I will add a few columns in the form and table to capture details like ID and address etc. Lets say I want to be able to retrieve the image for a given ID using a query. Can you please tell me if that is possible and how. I understand that currently the form will just capture the image and whatever other details I add to the form, but if I want to store the image for a give n record what do I do, is it possible and how? You can retrieve image fields the same way you do with regular ones. If you describe more detailed, what are you trying to do, I can help you better. There is no way to reregister AccessImagine. But you will not get any downsides about your e-mail not working anymore.